A new study of NGC 2024 and the Orion Nebula Cluster show stars on the outskirts of these clusters are older than those in the middle. This differs from predictions of the simplest ideas for how stars like our Sun should form in these clusters. Astronomers developed a new technique using data from Chandra and infrared telescopes to make this discovery. Stars are often born in clusters, in giant clouds of gas and dust. Astronomers have studied two star clusters using NASA's Chandra X-ray Observatory and infrared telescopes and the results show that the simplest ideas for the birth of these clusters cannot work, as described in our latest press release. 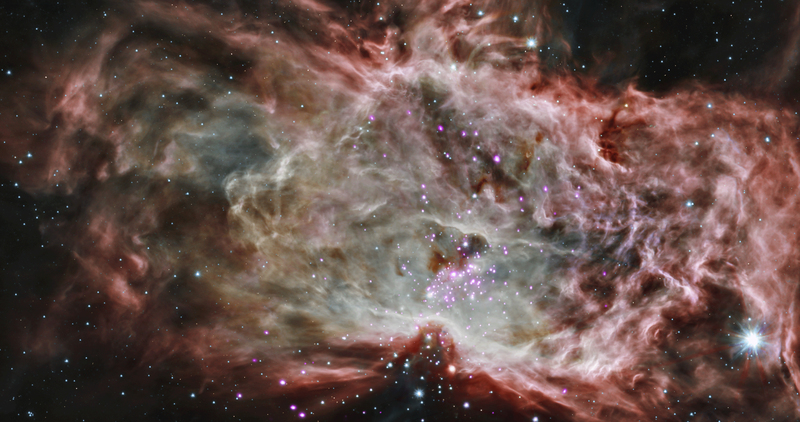 This composite image shows one of the clusters, NGC 2024, which is found in the center of the so-called Flame Nebula about 1,400 light years from Earth. In this image, X-rays from Chandra are seen as purple, while infrared data from NASA's Spitzer Space Telescope are colored red, green, and blue. A study of NGC 2024 and the Orion Nebula Cluster, another region where many stars are forming, suggest that the stars on the outskirts of these clusters are older than those in the central regions. This is different from what the simplest idea of star formation predicts, where stars are born first in the center of a collapsing cloud of gas and dust when the density is large enough. The research team developed a two-step process to make this discovery. First, they used Chandra data on the brightness of the stars in X-rays to determine their masses. Next, they found out how bright these stars were in infrared light using data from Spitzer, the 2MASS telescope, and the United Kingdom Infrared Telescope. By combining this information with theoretical models, the ages of the stars throughout the two clusters could be estimated. According to the new results, the stars at the center of NGC 2024 were about 200,000 years old while those on the outskirts were about 1.5 million years in age. In Orion, the age spread went from 1.2 million years in the middle of the cluster to nearly 2 million years for the stars toward the edges. Explanations for the new findings can be grouped into three broad categories. The first is that star formation is continuing to occur in the inner regions. This could have happened because the gas in the outer regions of a star-forming cloud is thinner and more diffuse than in the inner regions. Over time, if the density falls below a threshold value where it can no longer collapse to form stars, star formation will cease in the outer regions, whereas stars will continue to form in the inner regions, leading to a concentration of younger stars there. Another suggestion is that old stars have had more time to drift away from the center of the cluster, or be kicked outward by interactions with other stars. Finally, the observations could be explained if young stars are formed in massive filaments of gas that fall toward the center of the cluster. The combination of X-rays from Chandra and infrared data is very powerful for studying populations of young stars in this way. With telescopes that detect visible light, many stars are obscured by dust and gas in these star-forming regions, as shown in this optical image of the region. These results will be published in two separate papers in The Astrophysical Journal and are available online (papers 1 and 2). They are part of the MYStIX (Massive Young Star-Forming Complex Study in Infrared and X-ray) project led by Penn State astronomers. Coordinates (J2000) RA 05h 41m 46.30s | Dec -01° 55´ 28.70"
This is a good find. How will this change the concept of star formation? The Chandra delivery of new insight into Formation of Star Clusters is preceded only by your earlier excellence in all matters. 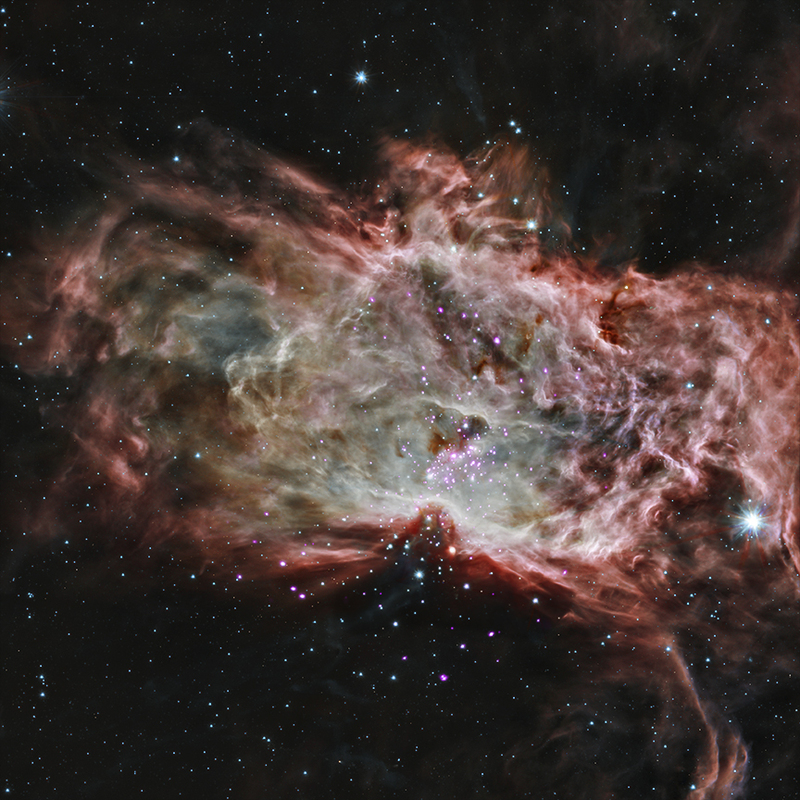 A star cluster, NGC 2024, which is found in the center of the Flame Nebula. About 1,400 light years from Earth. Combining X-rays from Chandra with infrared data from Spitzer Space Telescope. About 15 light years across. X-rays are purple, infrared red, green and blue. In the constellation Orion, visible in both Northern and Southern Hemispheres.